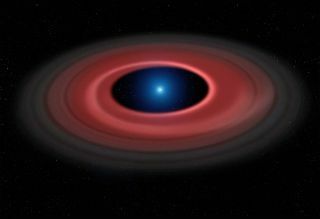 A white dwarf's gravitational pull tears apart an asteroid that approached too close, creating a ring of dust particles and debris, in this artist's impression. Researchers have imaged gas orbiting an Earth-size white dwarf, SDSS J1228+1040, over the course of 12 years. A "zombie" star and the remains of its "lunch" are revealed in a new close-up view, 12 years in the making. When an asteroid wandered too close to an Earth-size white dwarf — the dense core of a star at the end of its life — it was drawn in and destroyed by the star's gravity. Its remains formed a lopsided, glowing gaseous ring around the star — zoom in on the illustrated scenario here. "The image we get from the processed data shows us that these systems are truly disclike, and reveals many structures that we cannot detect in a single snapshot," lead author Christopher Manser, a Ph.D. student at the University of Warwick in England, said in a statement. Smaller stars near the end of their life balloon out into huge, red giants before running out of fuel. Then, they eject the excess gas, and the tiny, dense core remains as a white dwarf. The process disrupts and destroys planets and asteroids orbiting the star, and the white dwarf left behind can smear an object that approaches too close into an orbiting gaseous ring. Only seven white dwarfs have been found surrounded by such an orbiting disc, ESO officials said in the statement, so the detailed observations of this system are valuable in finding out exactly what happens to those objects that stray too close. The researchers used a process called Doppler tomography to measure the system in detail — distortions in the measurements of a particular component of the gas revealed its precise velocities. This plot shows the velocities of the gas in the disc orbiting the white dwarf star, mapped over the course of 12 years by the Very Large Telescope. Someday, the sun will go through the same process of growing to be a red giant and then dwindling to a white dwarf, so learning more about how orbiting objects fare could reveal more about our solar system's ultimate fate. "When we discovered this debris disc orbiting the white dwarf back in 2006, we could not have imagined the exquisite details that are now visible in this image, constructed from 12 years of data — it was definitely worth the wait," Boris Gänsicke, a co-author of the study and a physicist at the University of Warwick, said in the statement.